New from GF. . . If you already own Larry's great book, you'll welcome the chance to hear each tune performed by its arranger. Every solo in the book has been recorded! (Larry first prepared these CDs as a teaching aid for his private students. They are available to the general public only through Guitarist's Forum!) Highly recommended! This Guitarist's Forum release is temporarily Out-of-Stock. and we will be manufacturing new CDs very soon! To be notified of it's re-release, please click here for our e-mail. *Note: Above prices are for CDs only. Larry's book (below) is sold separately. 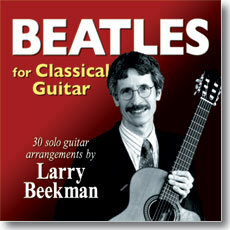 One of the most respected and highly regarded collections of Beatles arrangements. Several guitarists have recorded Larry's solos on their CDs, most notably Penny Lane, In my Life, and While My Guitar Gently Weeps. Features Beatles tunes not often covered, such as Cry Baby Cry and Hello Goodbye. Includes a total of 30 arrangements. Personally, I just can't stop playing Larry's treatment of Penny Lane. Highly recommended! CDs now availablesee above.